Even though it doesn't move, it almost looks like it will - which is due to the styling of the legendary Shelby Mustang. 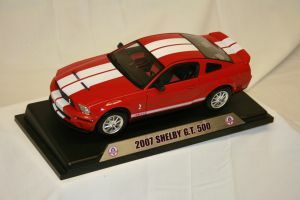 It's recreated here in die-cast metal, designed to Carroll Shelby's own specifications. With a beautiful double-stripe paint job in classic bright red, this model is perfect for any collector, young or just young at heart.